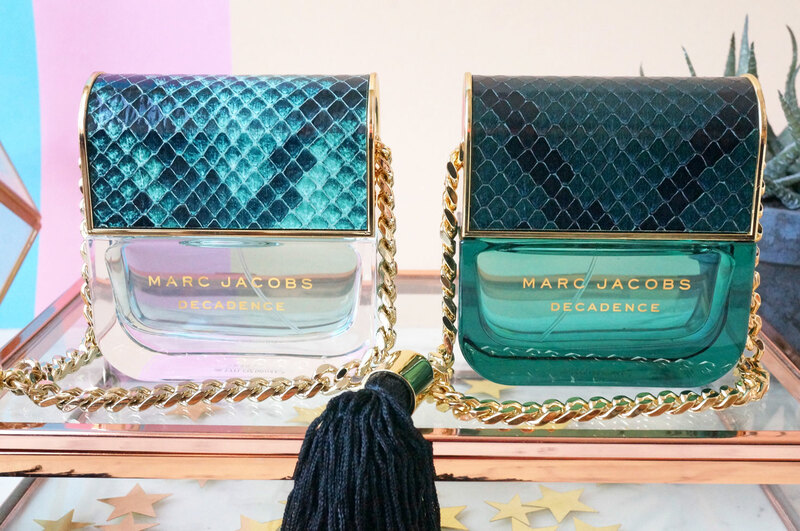 I remember when I first saw the original Marc Jacobs Decadence, I fell in love with the bottle instantly! It’s just so luxurious looking, and like no other fragrance bottle I’d ever seen – I knew I had to have it! 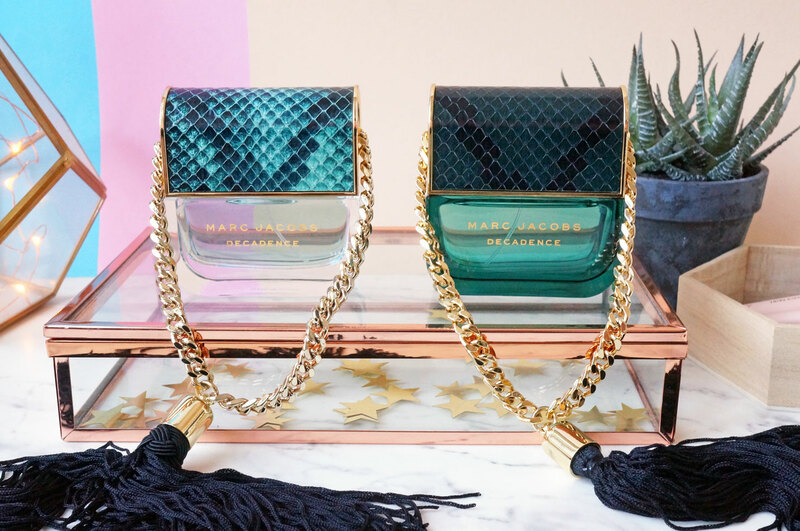 So the original Marc Jacobs Decadence EDP is a wonderfully glamorous and sensuous fragrance. It’s heavy and intoxicating, and most definitely an evening scent. It opens with a blend of Italian Plum, Iris and Saffron, and Bulgarian Rose, Jasmine Sambac and Orris at the heart, leading to a rich and tempting dry down of liquid Amber, Vetiver and Papyrus Woods. This is a sophisticated scent, grown up, striking and not easily forgotten. Top Notes: Italian Plum, Iris and Saffron. Heart Notes: Bulgarian Rose, Jasmine Sambac and Orris. Base Notes: Liquid Amber, Vetiver and Papyrus Woods. In comparison, the new Divine Decadence EDP is the perfect sister to the original scent. Described an effervescent, floral-woody expression of timeless glamour, Divine Decadence captures the same indulgent and luxurious nature as the original Decadence, but this time the mood is lighter, the scent more radiant and sparkling, compared to the heavy creaminess of the original Decadence. Divine Decadence opens with a radiant shimmer of almost-solar notes, including Orange Blossom and a pop of Champagne Extract. At the heart, the creamy floral explosion of Gardenia, Hydrangea and Honeysuckle are glamorous florals, leading to seductive notes of Amber and Vanilla combined with precious Saffron that linger on the skin at the base. Top Notes: Champagne Extract, Orange Blossom and Bergamot. Heart Notes: Gardenia, Hydrangea and Honeysuckle. Base Notes: Saffron, Vanilla and Liquid Amber. Overall, both scents are quite intense and I have a feeling you’ll either love them or hate them. If I had to choose though, I’d probably say I prefer Divine Decadence out of the two, just because it’s slightly lighter and more versatile to wear. 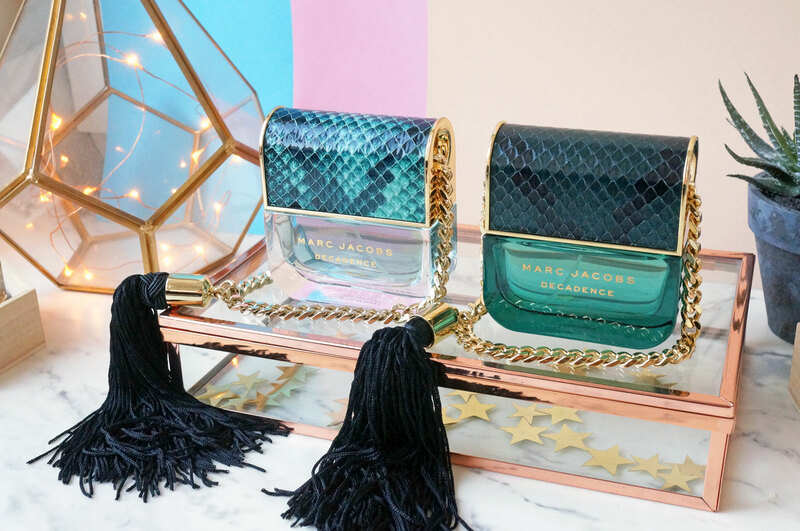 Marc Jacobs Decadence and Divine Decadence are priced from £49.00 for 30ml and available now at Boots.